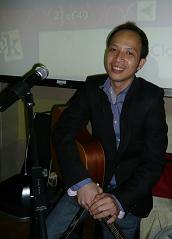 2001-Present: singer/instrumentalist at MusicDreamer Live! Café, specialized in pop guitar, pop piano and contemporary singing in Chinese and Cantonese. – Performed in various YES933 outdoor events such as 2002 Anniversary celebration at Star Cruise, 2002 School Concert at Ngee Ann Polytechnic, 2002 Christmas Celebration at Hardrock Café and has worked with Taiwanese artists such as Leehom Wong (王力宏) , Jiang Mei Qi (江美琪) and local artists such as Terence Chao, Tay Ping Hui, Zhou Chong Qing, Superstar winners Daren Tan & Diya (for Sony & Sony Ericsson Press Conference) etc. From as young as 8, George started embarking on his musical pilgrimage. 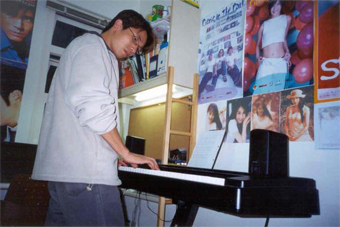 The first musical instrument he learnt was the piano and when he was in ACS, he went on to learn to play the flute. 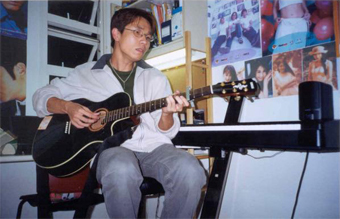 In school, he was selected for MEP (Music Elective Programme) and was the college pianist during his JC days. Having such deep passion for music, he subsequently enrolled into NTU-NIE Music Programme and taught Music in secondary schools. 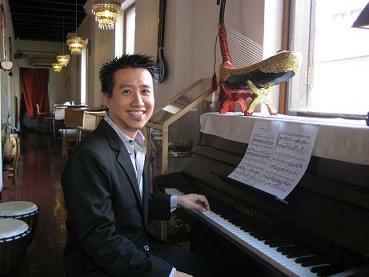 For the last 15 years, he has been consistently teaching piano of which some of his students completed their Grade 8. George taught Classical Piano, Adult Piano and conducted Classical Theory classes in Cristofori Music School for 8 years. He has been the Music Director of Global Sounds Music School for 4 years and is still teaching piano to both children and adult learners. 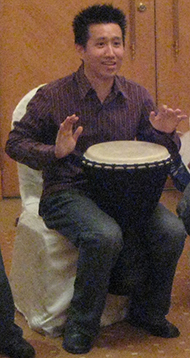 He also trains school students as well as corporate sectors to play the African Drum and African Marimba and is registered with the National Arts Council as a trainer for the African Drum Circle. His interest remains in imparting his music knowledge and skills to the next generation as well as ardent music lovers. Ruby started out as a choir girl in school and has diligently honed her skills through the years. Being from a musical family, she has always found joy through singing in front of people and opportunity came knocking at her door. Chance meets talent and it exploded into a great series of events, and she calls them milestones. She has performed at places like Riverine at Robertson Quay, Timber 2, Em by the River (Gallery hotel), Esplanade Waterfront, private corporate dinner and weddings. Ruby cites Celine Dion, The Carpenters, Mariah Carey and Frank Sinatra as her main influences. Be sure to hear a touch of jazz, pop, sentimental tunes at her gigs, comprising of both Chinese and English numbers. Many have been amazed by her incredible tonal quality and warmth in her voice; among which includes credible producers and artiste managers. As an instructor, Ruby is always ready to share her insights and music knowledge with her students. She believes everyone has the ability to sing well, with a heart of passion. – Short Performance gig at Timbre. Si Tong took an interest in singing at the age of 15, and furthered this passion by participating in many singing competitions. 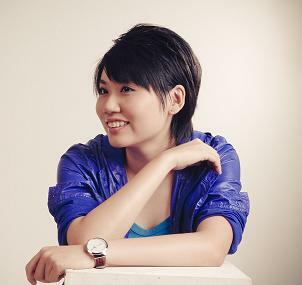 In 2006, Si Tong started professional pop vocal training under renowned music instructor Nicole Lai (黎珈仪), and took up pop keyboard and classical piano lessons with Peng Chi Sheng (冯启胜), and has achieved Honours in many certified examinations under London College of Music(LCM) and ABRSM. In 2009, Si Tong released her first EP 《说一次你爱我》, and as a singer-songwriter, she has also written and sold lyrics for local drama and telemovie series'(namely 《过好年》and《皇帽瑞狮喜迎虎》) theme and sub-theme songs. Thereafter, she was invited by Esplanade to perform her own compositions at their Huayi Festival 2010 during the Chinese New Year at the Esplanade Concourse. Having performing experiences in many events and local cafes, Si Tong has definitely achieved the skills of performance, and this has always been part of her teaching syllabus. Being a patient instructor, Si Tong believes in giving ample time for her students to learn and grow musically, encouraging them on consistent learning, and preparing them for greater challenges. – Showcased at COMPASS 2nd Musical Showcase. 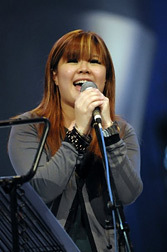 – Guest Performer for Launch of Singapore National Paralympics Team 2008, and presenting the theme song during the celebration ceremony. – Appeared on U Weekly magazine 《名人家居》. 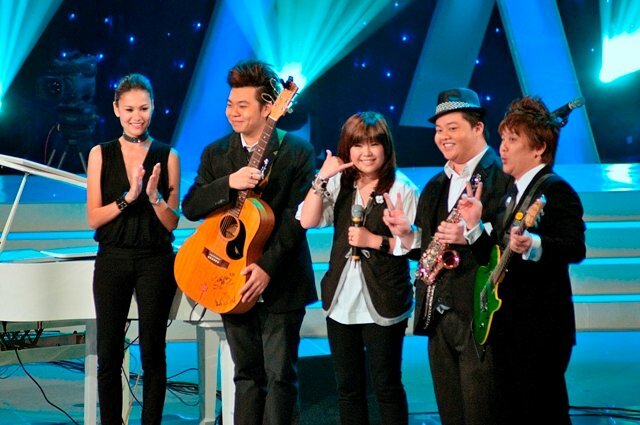 – Appearance on Malaysia TV8《八八六十事》, and various local radio stations such as 100.3FM and Redifussion, for “Love Infinity 2008″ Promotion. – Performed at various travel fairs, and local cafes. – Released an EP 《说一次你爱我》. – Demo sharing and interview on radio station 100.3FM. 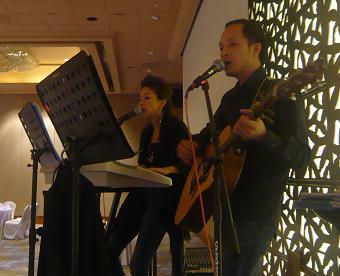 – Performed and shared original music works at Esplanade Library. – Written and sold lyrics for local drama and telemovie series’ theme and sub-theme songs. 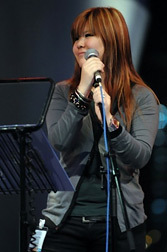 – Performed and shared own compositions during Huayi Festival 2010 – Local Singer-Songwriter at the Esplanade Concourse. – Main Pianist for “Living with Betsy Teo, Peiyi and Si Tong” unplugged concert at the Arts House, playing more than 10 songs on the piano. – Keyboardist for local artiste, Tay Kewei, during NEA Eco Music Challenge 2010 promotion. – Freelance Pop Vocals and Pop Keyboard Instructor at Maranatha Music School and Intune Music School. – Conducted basic songwriting and lyrics writing workshops for NEA Eco Music Challenge 2010 at various primary, secondary and tertiary schools such as Raffles Girls’ Primary School, Raffles Institution, Pioneer Primary School, NAFA, Rosyth School, Ang Mo Kio Secondary School, Hwa Chong Institution, Damai Primary School, Tanjong Katong Girls’ School and Cedar Girls’ School. – conducted basic songwriting course at Chong Fu Primary School.